Get the feeling of real zero gravity onboard the IL-76 MDK airplane! SPECIAL OFFER - get a 30% discount! An exciting tour to the Baikonur including watching Soyuz MS-13 spacecraft crew launch to the ISS. Visit Baikonur cosmodrome and watch the lift-off of the Progress ISS supply spacecraft! Amazing aerobatics on L-39 and L-29 jets! Pair and group flights are also available. Progress MS-11 resupply mission to the International Space Station launched from Site 31/6 at the Baikonur Cosmodrome in Kazakhstan on the 4th of April. Liftoff took place at 14:01 Moscow time, setting the stage for the spacecraft to rendezvous with the outpost just over three hours later. On April 12, 1961, for the first time ever mankind went beyond the limits of the home planet and entered a new space age. We congratulate all space and cosmonautics fans on this great day and wish you all space health, peaceful skies, new heights and fantastic discoveries! On the 14th of March at 10:14 pm (Moscow time) it once more roared at the Baikonur cosmodrome. A spacecraft with a crew of three onboard was launched into space: A. Ovchinin, N. Hague and C. Koch. The MS-12 crew emblem was almost a copy of the MS-10 crew emblem, the spacecraft-launch of which went down in history as the first unsuccessful one since 1983 (!). Well, the Russian cosmonautics does not rest and goes on developing. Even strong frosts this year are unable to discourage tourists from discovering the world of cosmonautics. Besides, Gagarin Cosmonaut Training Center at Star City looks as astonishing in winter as in summer. Our French guest didn’t fear colds neither. 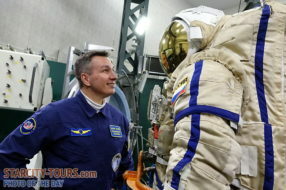 The beginning of February was marked by another tour to Gagarin Cosmonaut Training Center. Sebastian’s wife asked us to arrange the tour programme as a gift to her loved one. Our regular guest, a space admirer from Switzerland, get acquainted with the Egress-2 simulator of the Cosmonaut Training Center. 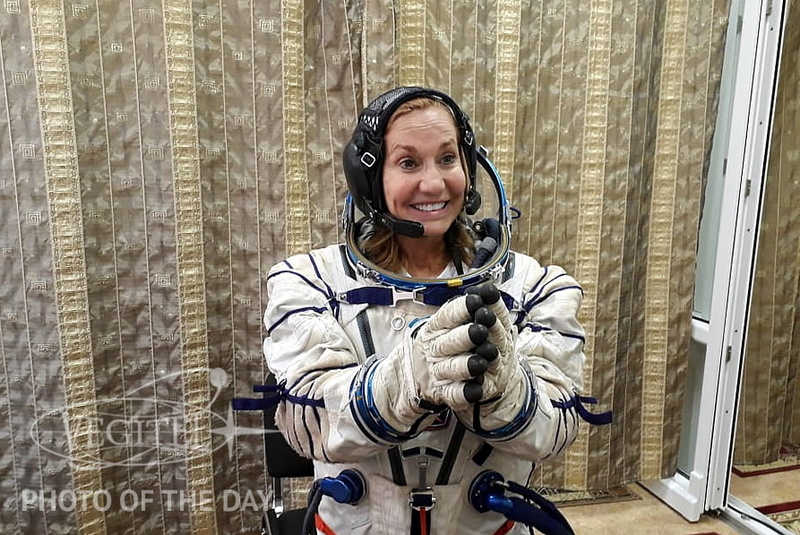 This simulator is designed for spacewalk training (extravehicular activity) and allows cosmonauts to simulate the state of weightlessness and even the gravity of other planets when training in Orlan spacesuits. Another tourist program in Star City today. Our guests are wearing Sokol spacesuits. 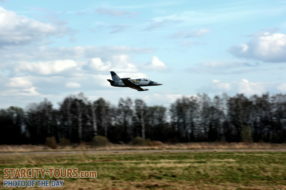 Ultra-low passage allows you to enjoy the amazing speed of a L-39 jet trainer. Book flights for yourself and your loved ones, feel the real dynamics and adrenaline! 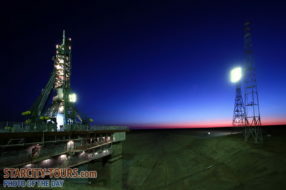 We are still accepting participants to our exclusive tours to the Baikonur Cosmodrome. 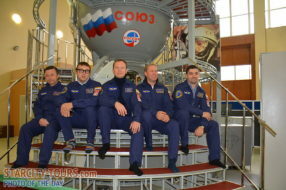 New confirmed launch date for Soyuz MS-13 is July 20, 2019. If you become a participant in our tour you’ll be able to see all the stages of the preparation and the launch of the spacecraft. The lift-off of a rocket is an amazing spectacle and memory for the rest of your life! 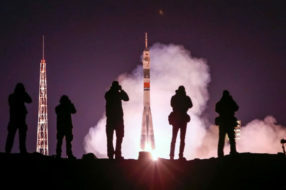 On the eve of Cosmonautics Day on April 12, interest in «space» objects from tourists from around the world is growing. 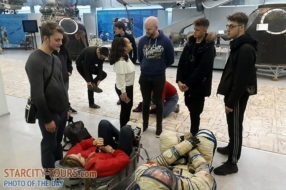 A few days ago, our group of more than 20 British students visited the Memorial Museum of Cosmonautics and the RSC Energia Museum. Program participants familiarized themselves with the history of the national space program and were able to see unique exhibits. Blastoff! Soyuz booster with a resupply Progess spacecraft was successfully launched to the ISS several minutes ago. 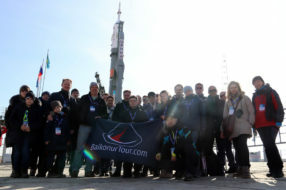 For the group of our tourists this event became a highlight of their five-day journey to Baikonur spaceport. Meanwhile we continue admission to the next launch tour – in July we’ll see off the international crew of Soyuz MS-13 spacecraft leaving for mankind’s orbital outpost. Send your applications and book tour slots for yourselves, friends and families! The main adventure of this summer is just around the corner! 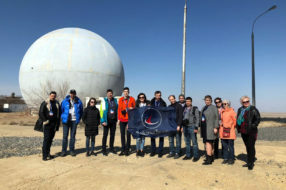 Today, the participants of our Baikonur tour conducted an excursion of the historical facilities of the cosmodrome, reflecting the various stages of the national space program. The launch of the Progress cargo spacecraft will take place on April 4, at 14:01 Moscow time. A group of our guests, students from India visited the RSC Energia Museum today. Here you can touch the living history, see the originals and relics of the first years of space exploration. The descent vehicles of Gagarin’s Vostok-1 and Tereshkova’s Vostok-6, Voskhod-2 spacecraft used during the first spacewalk in history, the first ever satellites, interplanetary space probes and many other exhibits reflecting the development of the Soviet anf Russian space program. 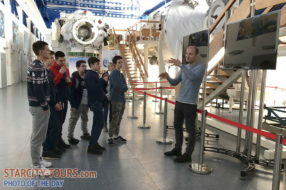 Our educational programs based on Gagarin Cosmonaut Training Center are interesting and enlighting activities which will positevly become a real space adventure that will be a good memory for both adults and children. You will discover the mystery secrets of space, expand your knowledge in the austronautic science and spaceflight. Moreover, you will personally explore the museum space collections and find yourself in the real functional Gagarin Cosmonaut Training Center! We continue the group admission to zero-gravity flights on April 25 and 26. You still have time to sign up for the main adventure of the year! Participants of our tour to the Baikonur cosmodrome on the launchpad with the Soyuz launch vehicle. We have a lift-off! Last night, a large group of our tourists at the Baikonur cosmodrome watched the launch of the Soyuz MS-12 spacecraft with an international crew. The night launch of the rocket was the completion of a rich five-day program at the cosmodrome. We continue to accept applications for the next space launch, which will take place preliminary on July 6. The participants of our tour to the Baikonur cosmodrome are present at the traditional farewell with the crew. Launch is already tonight. 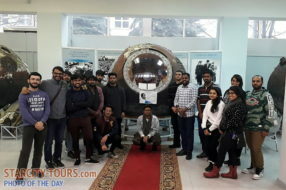 Today, the participants of our tour to the Baikonur cosmodrome got acquainted with the historical objects of the first space harbor of the Earth. The participants of our tour to the Baikonur cosmodrome share their first day impressions with journalists of the RT channel. This morning the participants of our Baikonur cosmodrome tour observed the roll-out of the Soyuz MS-12 launch vehicle from the Assembly and Testing Complex and its installation on the launch pad. 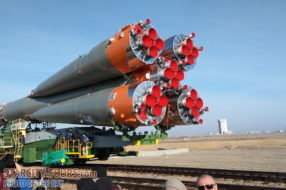 Today a large group of our tourists arrived at the Baikonur Cosmodrome. Tomorrow morning, they will observe the roll-out of the launch vehicle from the Assembly and Testing Complex and its installation on the launch pad. 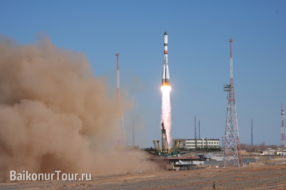 Ahead is a rich five-day program at the cosmodrome, the key point of which will be the night launch of the Soyuz MS-12 spacecraft. 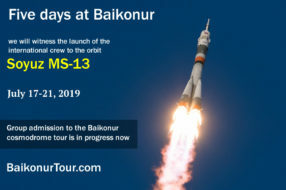 And we continue to accept applications for the next tour — the launch of the Soyuz MS-13 spacecraft is scheduled for July 6. Join our next amazing Zero-Gravity flights on April 25 and 26, 2019! 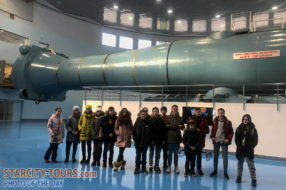 The young participants of our Star City tour are in the Centrifuge-18 hall. This enormous 300-tonn construction can simulate any g-loads which occur during the launch and the landing of a spacecraft, thus preparing the crews for g-loads. The participants of our Baikonur tour are at the prelaunch parting ceremony of the international crew of the Soyuz-MS spacecraft which will set off to the ISS. 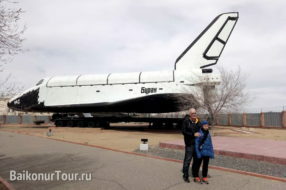 This is just one episode of our eventful 5-days’ tourist programme at the Baikonur cosmodrome. 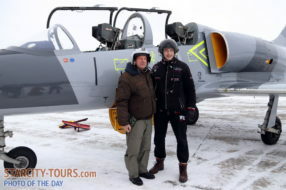 The winter season of L-29 and L-39 jet-trainer flights is coming to an end. Tens of our guests from various parts of the world could fully feel the real speed, appreciate the extreme sensatons and the adrenaline rush of advanced aerobatics and to join those few who know the real sensation of a flight. Spring is coming along with many new adventures in the skies! Book your flight on a jet-trainer for yourself and your dear ones, we fly every day! Corporate programmes in Star City developed by us in collaboration with Gagarin Cosmonaut Training Center will not just let you to enjoy a great and entertaining event but also to unite people making them a real team — just like a crew of the spacecraft. There is just one week left for accepting requests and launching the admission clearance procedure to take part in the coming tour to the Baikonur cosmodrome! On April 4 a Progress cargo spacecraft will set off to the ISS. 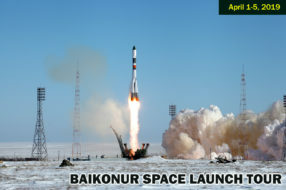 The rocket launch will be the climax of the intense 4-days’ programme in Baikonur. Hurry up, the opportunity is running out! 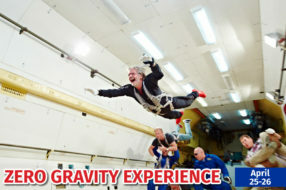 Zero gravity experience is an adventure for genuine connoisseurs of extreme sensations. On April 25 and April 26 two teams of our guests will fly onboard IL-76 MDK of Gagarin Cosmonaut Training Center. The plane performs zero gravity up to 10 times during one flight. The real zero-G can be felt only in space or in a flight like that. We can guarantee that the zero-G flight will become one of the greatest impressions in your life! 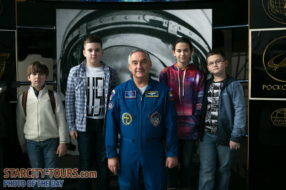 A Star City tour will be especially interesting for school students. Young guests will be able to learn about the past and the future of Russian cosmonautics, to see how cosmonauts live and work on orbit, get answers to many questions and even talk to one of the Russian cosmonauts.